Dancing on the Waves | Come Here To Me! The above is an excerpt from the Poor Relief (Dublin) Bill, 1929. 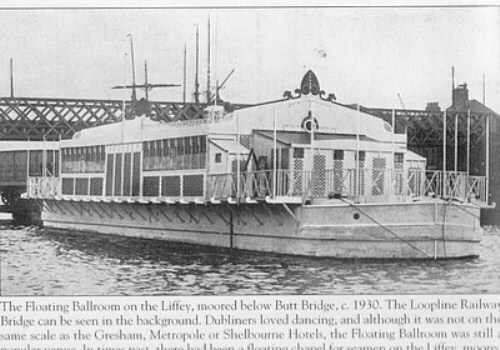 The Bill was put forward in order to help relieve the the impoverished in the greater Dublin area as the Free State, still in its infancy, struggled to deal with societal problems, yet still had money to put a floating ballroom on the Liffey during a Civic Week the same year, importing a band from London and causing much consternation in Dáil Éireann. The questions were put to General Mulcahy of the Cumann na nGaedhael led 6th Dáil by a Mr. Eamonn Cooney, who, though a member of Fianna Fáil, made quite an impassioned speech about the haves and the have- nots of Dublin, that can be found here. Very little about the barge itself can be found, and it resides now, a rusting wreck, on the scrub-lands at Bull Island.